Kids are full of challenging questions about the natural world especially when it comes to animals. Bugs are one of the most varied and intriguing forms of life they encounter. 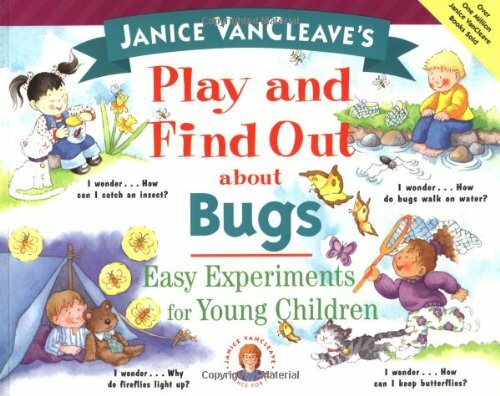 This new volume in the popular Janice VanCleave′s Play and Find Out series puts the answers to 50 questions kids commonly ask about bugs at parents′ fingertips, in the form of easy and playful experiments that let children discover the answers on their own. Each experiment is introduced with a simple "Wonder" question, such as "I wonder how bugs can walk on water?" And there are "More Fun Things to Do" to further explore each topic. Easy–to–follow steps demonstrate simple experiments that kids will love. Big, two–color illustrations show exactly how to do each activity. Janice VanCleave (Riesel, Texas) is a former elementary school and high school science teacher who now spends her time writing and giving science workshops. She is the author of more than three dozen children′s science books with sales totaling more than one million copies. From the Back Cover&colon; How can I catch a flying insect? Play and find out! How? By choosing one of the 50 simple experiments in Janice VanCleave′s Play and Find Out about Bugs. Your child will discover the answers to lots of fun questions as you team up to play together and explore the wonder of our world. Each experiment includes illustrations, a list of easy–to–find materials, and simple, step–by–step instructions.